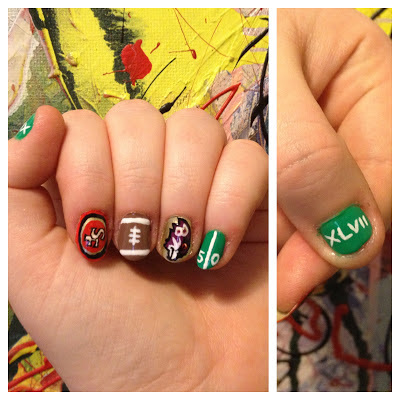 49ers logo, Ravens logo, field marking, 'XLVII', and a football (To see my tutorial on football nails visit - http://natsnailart.blogspot.co.uk/2013/01/football.html or http://www.youtube.com/watch?v=AdRtsLqyXXM). 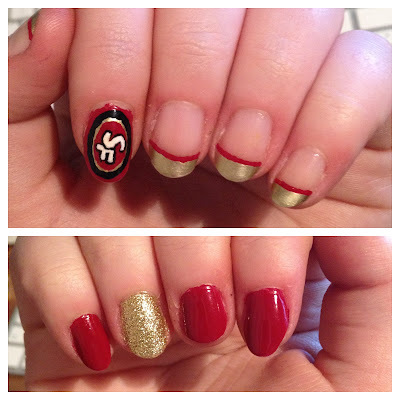 Left hand: index - 49ers logo, and the rest gold french manicure with red stripe. .........I LOVE FOOTBALL!! I am a New Orleans' Saints fan! But I love the 49ers, (and they are my fiancée's fave team), so I am rooting for the niners in this year's Super Bowl.